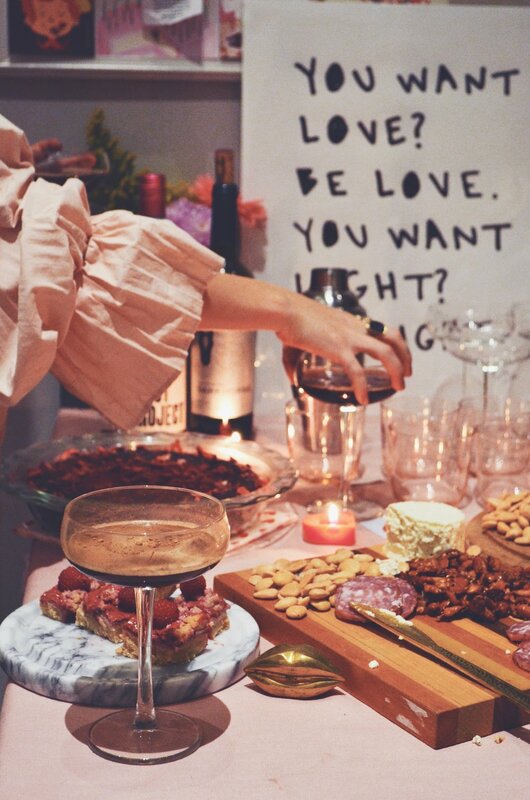 This Valentines Day, our youngest Whelan Girl, Mimi hosted a Valentine’s Soiree to christen her new little NYC apartment. So what are the ingredients to a great party for a novice entertainer you ask? Focus on a few details and make them shine. As a paper and design studio, we seize any opportunity to create custom invitations. What better way to make your guest feel special than a personal invite in the mail? A lost art in our tech savvy generation. Take note my friends, get yourself an address book! In true Whelan Girl fashion, the menu was dessert forward - featuring chocolate torte, raspberry bars, cheesecake, and sugar cookies. 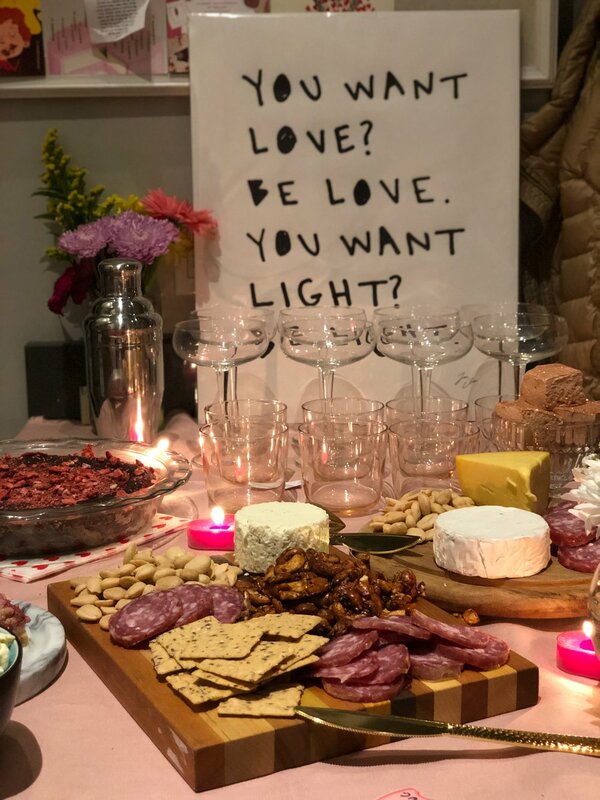 With the help of her roommate Danielle and her favorite local bakeries, Mimi created a sweet spread to delight even the most seasoned dessert connoisseur. 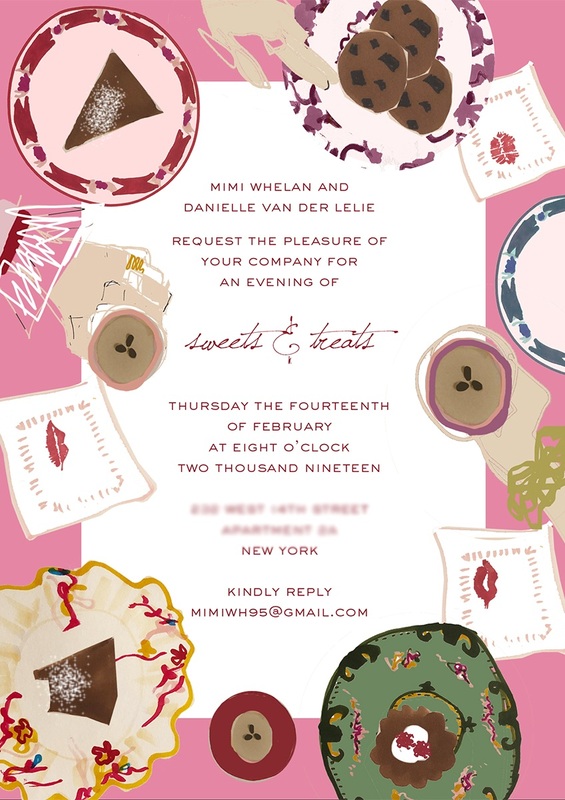 To cut the sweet and incite the sass, Mimi greeted each guest with an Espresso Martini in a pink tinted coupe. Inviting guests into a warm and welcoming environment is key. Lights dimmed, candles lit and Billie Holiday in the background set the mood. Designing Woman was projected on the not yet decorated wall. As the evening continues and knives start cutting into dessert, the party moves into the living area. 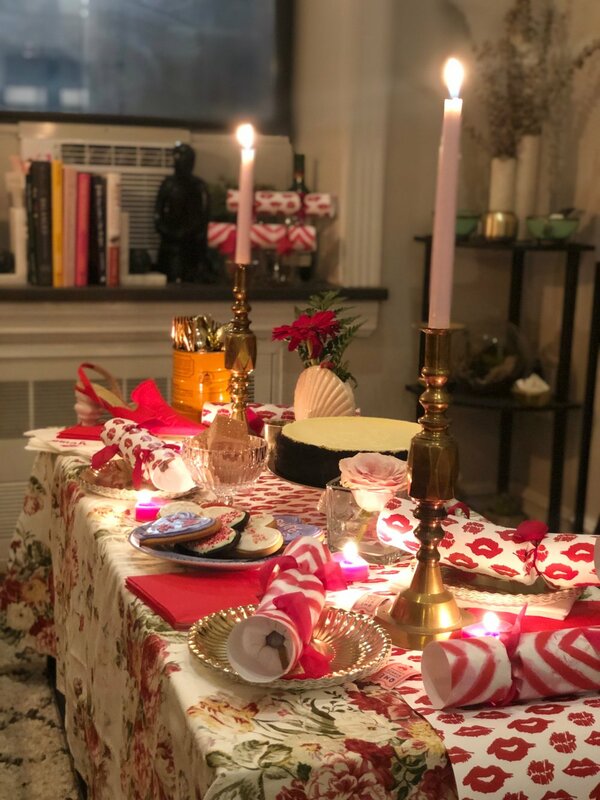 The coffee table (because who has room for a dining table) transformed with in a loral table cloth- thanks Sara- tall pink candle sticks and a few Whelan Girls place settings. 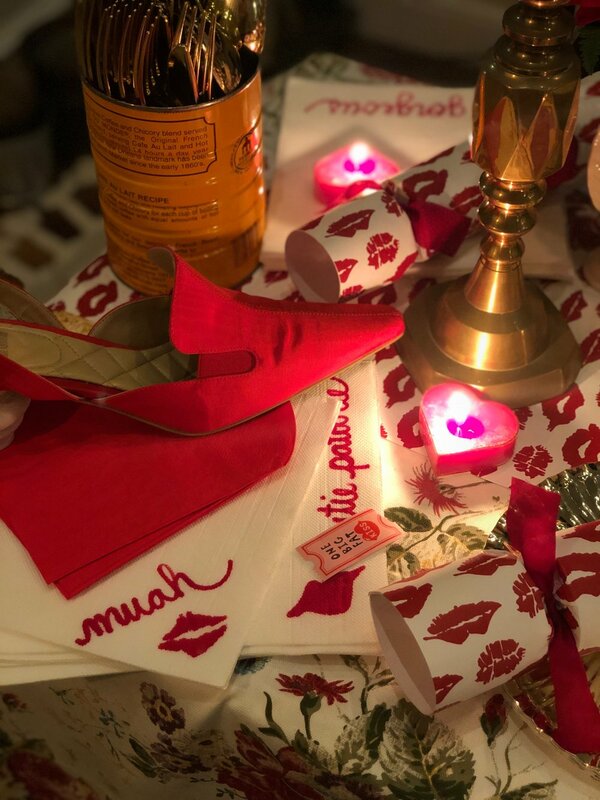 After diving into the sweets and sipping on cocktails, guest grab a fun filled kiss cracker. The countdown ends in squeals and a sharp pop. Bubbles, erasers, chocolates, bouncy balls, and heart shaped rings are strewn across the room. 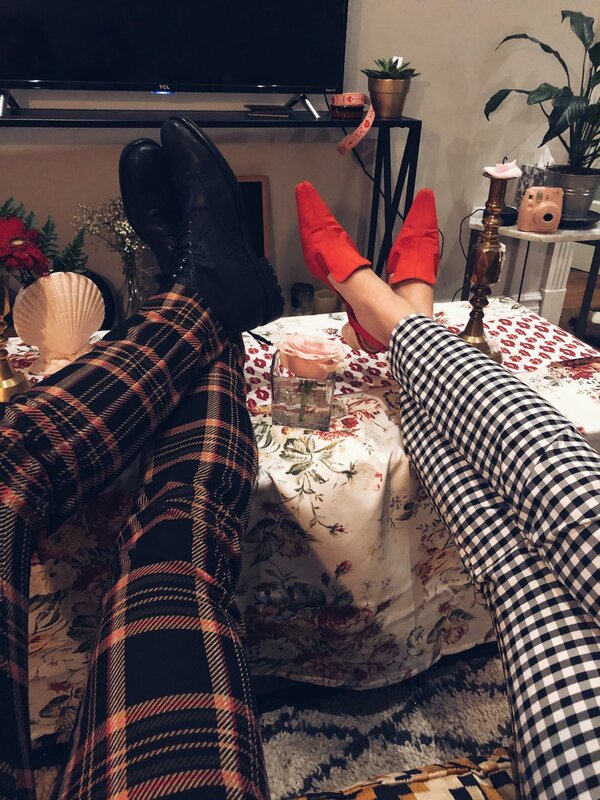 If someone enters the party at this point, they are met with a room full of 24 year olds blowing bubbles and chasing bouncing balls across the limited square footage of this West Village apartment. Few borrowed pieces from a fellow hostess--Sara Mullaly…. What other 23 year old can you depend on for crystal candy dishes and floral tablecloth? A special touch--Sharpie in hand Mimi took the plain white napkins and added a Whelan Girls touch. Each paper napkin sealed with a kiss and compliment.